It’s the best of times and the worst of time for people wanting to break into journalism. The best of times because cutbacks by news organisations around the world means there are arguably more openings than ever for freelancers. But the worst of times because while nearly every major news organisation in the world has openings for journalists, in many cases they are only available to those willing to work weekends and late at night. Likewise staff jobs for journalists, with pensions and paid holidays, seem to be fewer and further between. So how can budding freelancers find the right work/life balance and earn enough to keep their head above water? This month we talk to award winning freelance photographer Patrick Brown, who recently won a World Press award and has worked for many leading publications as well as the UN in danger zones. Patrick Brown, how did you break through into freelance photojournalism? I began my career as a theatre set builder in Perth, Australia, while at the same time studying art at night school. I was also working at a multi-storey carpark at the time and remember reading an article about an Australian surgeon, Robert Weedon, who was working in Malawi. At the time, he was the only trained surgeon of two-and a-half million people. Robert’s life was especially of interest to me because three years earlier he treated me for an internal hernia – basically I had ruptured my bowel and was being poisoned by my bile. He diagnosed my illness, operated on me and saved my life. I sold my car and my surfboard so that I could fly out to Malawi in 1994 and take photos of Dr Weedon’s out there. I used 24 rolls of black and white films and 26 rolls of colour. I was able to use the photos to document his work as well as Malawi’s transition from a dictatorship to a democracy. I had an exhibition which was a great success in Perth and the same time I had the images published in The West Australian Magazine, which raised money for Dr Weedon’s work and the people of Malawi. I realised at the point that photographs can change people’s lives. From then onwards I began working for the magazine and started venturing out to Asia to cover stories. In 1997, I went to Hong Kong to over the British handover to the Chinese. In the same year I went to the Perpignan Photo Festival, where I met like-minded photographers. I decided after that I would move to Asia, and did so in 1999. From there I worked on a variety of photo projects, but specifically I was introduced to the forests, jungles and people of the Thai-Burma border. My long-going love affair with Asia had begun, and I have now worked in most of the countries of the region for a variety of well-known publications including Human Rights Watch, Amnesty International and the UN. I am pleased to say that during the course of my career I have had a multitude of high points. I have also been lucky enough to work with some incredibly talented and generous people who in the earlier part of my career were kind and patient enough to show me the ropes. Apart for the Robert Wheedon project, other high points include a project I worked on which chronicled the trafficking of endangered animal species in South-East Asia. It was 10-year multi-award winning photo-documentary which culminated in a book I produced in 2014 – in partnership with journalist Ben Davies – entitled Trading to Extinction. 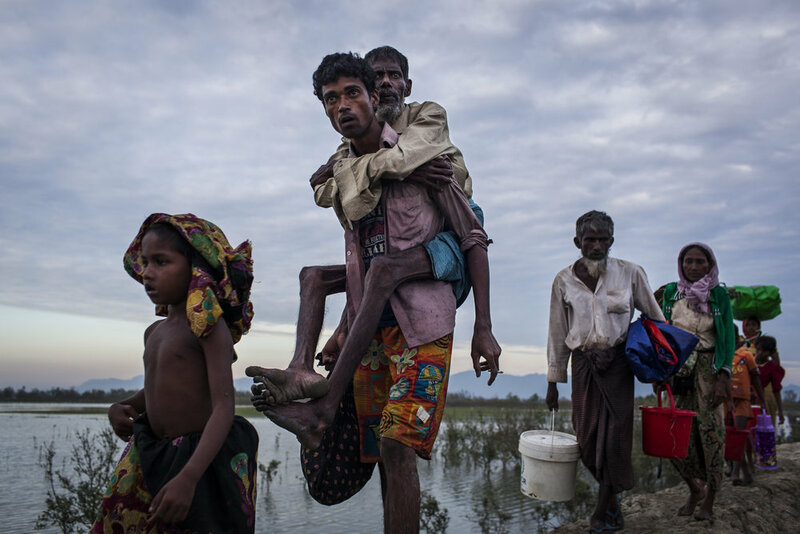 Another story I will never forget is the mass exodus of 750,00 Rohingya refugees from Myanmar to Bangladesh from August and September 2017 onwards. The images were nominated for the World Press Photo award and won first prize in the Single Image news category. In 2012 the company behind a Crowdfunding campaign that I had launched to finance the launch of Trading to Extinction went bankrupt, which meant that I lost nearly $30,000 of my own money. The whole experience left me disheartened and even left me losing all my motivation for photography. But then I realised that it was not photography I disliked but some of the business interests behind it, where everybody is out for themselves. I understood then that I needed to reignite my love affair with photography, and it took some time to find it again. Another downer about being an around-the-world photojournalist is this: You have to endure countless bouts of upset stomachs, not to mention illnesses of all description. What’s your advice to freelancers eager to start in news photography? Never take no for an answer and keep developing your own narrative. Trust your inner voice and never stop growing or learning. Above all, look after your back – taking photos when it’s painful is a nightmare. How do you juggle the work/life tussle? Few news photographers have to endure the horrors of the daily commute and even fewer freelance news photographers do. For most international news journalists and photographers, the 9-5 job doesn’t come into it. You are on the road all the time. It’s quite a lonely existence. I’m afraid to say that it’s not nearly as romantic as all the Hollywood movies make it out to be. Be prepared to put in a lot of time away from your family to pursue your career. It can take years. When I am in the field I try to stay motivated by finding new things – and if necessary new ways – of new ways of photographing stuff. If you can travel with a colleague or a friend do so. It can be unpleasant when you have no-one to bounce ideas off and all you have is your own echo chamber. What are the benefits and drawbacks of being freelance? You have the freedom to pursue your own narrative even if it fails. The most creative people I have met are freelancers. The reason I feel this is because it is an uncomfortable existence financially and that discomfort has challenged me to push myself into creative areas that sometimes do not work. But if you want a comfortable and financially secure existence, I’m not sure I would recommend a freelance career to anybody. On an average year I am earning only about 30,000 GBP gross and on top of that I have to buy a lot of equipment in addition to covering my travelling expenses and sundry other payments. But on the plus side I have more freedom to make decisions in relation to my job. I am the janitor and the CEO of my business. I have to do everything. How do you cope with the trauma of some of the events that you have witnessed? When I witness bloodshed or suffering I remember that I am only a visitor to the scene that I am bearing witness to. I cope with it by thinking that this is not my reality – my reality is far away. Bearing witness is in no way the same as personally experiencing the injustices or suffering that I am photographing. You have to stay detached, otherwise you cannot record an event from an objective perspective. But I must emphasise that this doesn’t mean to say I’m not affected by what I have witnessed. I get affected afterwards when I’m going through my edit – the trauma in effect has been delayed. I would find it much harder to cope with out my biggest support – my wife Camilla – and my family and friends. Find out more about Patrick and his work over on his website.